EDINBURGH, Scotland, 2018-Jul-27 — /Travel PR News/ — A 19th Century house in the heart of Loch Lomond has been awarded a Four Star Gold award by VisitScotland. 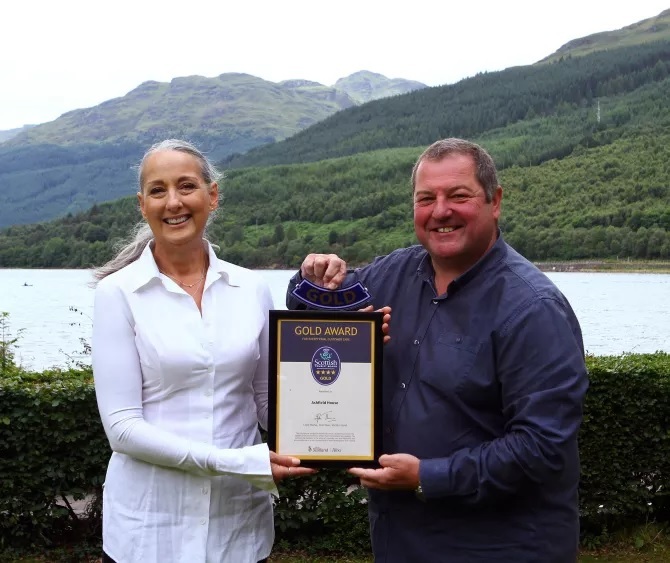 Ashfield House B&B, situated in the Arrochar Alps on the shores of Loch Long in the village of Arrochar, was upgraded from Four Stars by the national tourism organisation’s Quality Assurance (QA) Scheme in recognition of its excellent standards and outstanding customer service. The Gold Star Award highlights establishments within the QA Scheme that strive to exceed customer expectations on an on-going basis, whilst taking an innovative and proactive approach to customer care. Cristina Sanchez-Navarro, a renaissance woman who runs the accommodation by herself, moved to the UK from New Orleans 15 years ago and was always drawn to Scotland. In 2015, she and her husband decided to leave their jobs and home in London so she could begin her new adventure of operating a bed and breakfast in Argyll. Blending the warm Scottish welcome with Southern American charm, Cristina prides herself in offering a truly unique service in a beautifully wild environment. Determined to ensure her guests have the best experience possible she has also joined the VisitScotland Information Partner (VIP) programme, committing to providing her local knowledge to visitors. This includes providing useful information packs with local restaurants and the best things to see and do in the area. Guests can also enjoy a traditional Scottish breakfast, with the extra treat of New Orleans-style pancakes. Due to its use of local produce, Ashfield House has received VisitScotland’s Taste Our Best accreditation. The B&B is also a member of the national tourism organisation’s Walkers and Cyclists Welcome Schemes and Cristina even provides bicycles for guests who are unable to bring their own. David Adams McGilp, VisitScotland Regional Director, said: “Congratulations to Ashfield House on this fantastic achievement. Scotland is renowned for being a warm and welcoming country and it’s great to see a local B&B owner going the extra mile to ensure our reputation is well maintained. Cristina is a credit to the region and to Scottish tourism. Taste Our Best, a joint initiative between VisitScotland and the Scottish Government is designed to recognise businesses including hotels, restaurants, cafes, takeaways, visitor attractions and B&Bs that not only offer a quality food and drink experience, but include and promote Scottish produce on their menus, giving consumers more choice. This entry was posted in Hotels, Tourism, Travel, Travel Awards, Travelers and tagged accommodations, Ashfield House B&B, awarded, Cristina Sanchez-Navarro, David Adams McGilp, Loch_Lomond, Perth, Scotland, VisitScotland. Bookmark the permalink.